1. Protect the green of the earth; The earth is the home of life. 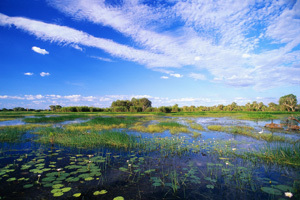 One example of our activities to protect the environment is our "Protect the Local Ecosystem" campaign. In farming villages, forests and wooded areas can be found along with rice fields. 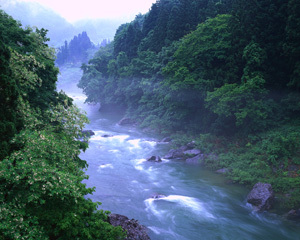 This is what we refer to as "satoyama," or an area where normal ecological cycles are supported by cultivation. Deciduous forests in the farm village ecosystem are a precious and essential resource both for the lives of residents and the survival of plants and animals. We pressure the local governments in various areas and raise money to buy land and carry out environmental activities in order to protect the local ecosystems from the wave of development. What kinds of things can we do as followers of Soto Zen to protect the green resources of the earth? First, visit your local temple or shrine and check out the trees and environment in the surrounding area. 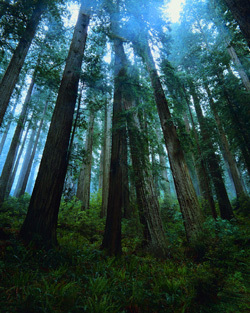 In some places there will be dense forests and in others nothing but concrete structures. Let's all give serious thought to what we can do to protect the forests if they are there and how to plant new trees if they are not. A group called the Ecological Life and Culture Organization surveyed high school students about their thoughts on forests. Some of the most common responses were, "They provide us with sanctuary," "They act as a natural dam to collect rainwater," "Mountains and forests provide us with gifts," and "They teach us the difficulty, importance and pleasure of cultivation." We must develop the habit of giving heed to soil, trees and water in order to preserve the green that surrounds us. If we leave things be in this society where global warming continues to progress, we will lose the trees. The thoughts of the high school students above will surely resonate with everyone. As is written in the first principle, the green earth is the home of all life. 2. Do not waste water; It is the source of life. The Soto Women's Society is involved in activities called the "Green Plan." For example, the Kanto chapter handed out stickers which listed things that can be done in the home to conserve water, nets for kitchen sinks, acrylic scrubbing brushes knitted by members and other items to passersby along streets beside large stations to raise awareness about the importance of environmental issues. They continue to knit brushes every day and hand them out to people in the area. There are plenty of other ideas as well for keeping water clean in our daily activities. In fact, most of these are not things that have just been started but have been rooted in people's lifestyles from long ago as "wisdom of the elderly." The Green Plan places high value on the wisdom of elderly people. We have much to learn from them about how to live in affluence while conserving energy. It is said that Dogen Zenji once drew water from a mountain stream and said, "May this water bring blessings to 100 billion people after me," after pouring half the water in the dipper back into the stream. That is how precious he considered water. Let's make it a habit to keep water clean and not to waste it. 3. Do not waste fuel or electricity; They are the energy of life. If this is done in all 1.7 million households of Soto Zen followers it will result in the saving of around 60,000 kiloliters of crude oil (or the equivalent of the annual consumption of roughly 7,500 households). To look at it another way, this would highlight just how much is wasted by a high growth society. The merits of offerings are taught in Shushogi, a Soto Zen sutra. It says, "Do not be greedy for offerings." This teaching can be applied in the conservation activities described above which will result in planting seeds of happiness for future generations. 4. Keep the air clean; It is the plaza of life. The Japanese Consumers' Co-operative Union carries out some noteworthy activities. The members of this union take their own bags to grocery stores and use them instead of the plastic bags at the register. As a result they eliminated the need for about 250 million grocery bags in 1996. This is the equivalent of 1,075.77 tons of carbon that was not released into the atmosphere. These types of records allow people to check the results, and this activity is important for getting into the habit of an energy-saving lifestyle. Soto Zen followers account for 1.7 million households, and the Green Plan calls for the participation of all members. It is an attempt to change lives and the world around us. Keizan Zenji taught that "the ordinary mind is the way." This teaching makes us realize that when a truth is discovered in everyday life and put into practice, such is the way of Buddhism. The atmosphere is what preserves the delicate balance for all life to exist, but mankind is on the verge of upsetting that balance. There is no other way to protect the environment than to do so in our daily lives. 5. Co-exist with nature; It is the embodiment of Buddha. He taught that all aspects of nature were the embodiment of Buddha. He also warned that not a single branch of a tree or plant was to be broken unless it was to be used in a ceremony and strictly forbade the unnecessary cutting down of trees. Keizan Zenji co-existed in harmony with nature and strived to live on a bare minimum of resources in order to protect it. To learn from the words and lives of these two founders of Soto Zen is to accept nature itself as the embodiment of Shakyamuni Buddha, to respect it, cherish it, learn from it, and live in harmony with it.